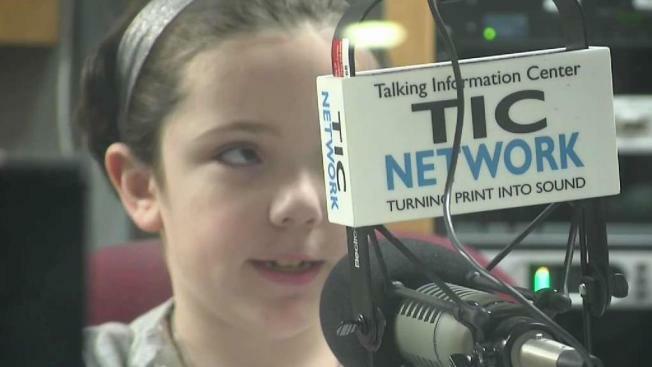 The Talking Information Center has long been a lifeline for visually impaired listeners, but the network's newest host is an 11-year-old girl who is completely blind. Inside a studio in Marshfield, Massachusetts, there is a radio station with a mission. The Talking Information Center, or TIC, has long been a lifeline for those who are visually impaired, but one of the network's newest hosts is also the youngest. Faith Murray, 11, of Weymouth, is completely blind. Through a partnership with the South Shore Educational Collaborative, Murray landed an internship at the radio network where hundreds of volunteers read magazines, newspapers and other print materials. Many of their listeners have low or no vision. The fifth grader started giving weather forecasts over the summer and was quickly promoted to have her own show. She now records a weekly segment called "Did You Know?" that seeks to educate listeners about visual impairments and other disabilities. She also delivers public service announcements. "I like talking into the microphone," Murray said. "And when I'm nervous, I just take a deep breath." With the help of the staff, Murray reads her scripts in Braille. Operations assistant Liz VandenBergh said she has been blown away by her progress. When VandenBergh asks if she is ready, Murray always responds, "I was born ready." "Being blind does not stop her from learning audio production and wanting to educate people about different disabilities. It's just incredible to watch," VandenBergh said. Murray's talent does not stop at the radio booth. She also delivered a speech at the network's 40th anniversary dinner. She helped auction off a teddy bear with bids beginning at $40. The bear sold for $650. "She's a star. What else is there to say?" said the network's executive director, Anna Dunbar. "We will have a place for her as long as she wants to keep coming." TIC reaches more than 30,000 listeners and can be heard online and on a free app.